Description: The beach of Poros provides a nice spot to relax. Its crystal water and the white pebbles attract many visitors. Description: Avithos is a nice beach on the southern side of Kefalonia. Golden and with crystal water, Avithos is surrounded by a wild steep cliff. Description: This beach is the closest to the airport of Kefalonia and it is usual that visitors see planes take on and off above their head. Description: Kaminia is a large, sandy beach on the south eastern side of Kefalonia. Its beautiful environment provides a nice settling for the sea turtles to nest and lay their eggs. Description: Located between the busy resorts of Skala and Lourdas, Katelios is a long sandy beach with relaxing ambience. Description: Lepeda is a sandy beach close to Lixouri, the second largest village of Kefalonia. The landscape includes the rocky surroundings of the beach, which are a real treat. Description: This is a long and sandy beach close to the capital town and the airport. It gets very popular in summer as it is organized and has some watersports centres on the coast. Description: Vrachinari is a picturesque small beach with sandy seashore. 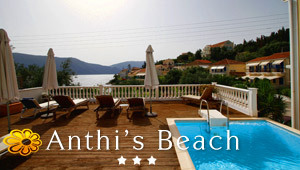 Due to its long distance from the busy resorts of Kefalonia, it usually doesn't get frequented.